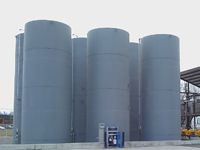 We have constructed several Bulk Storage Facilities for independent oil companies throughout VT & NH for all petroleum storage products. No project too small or big, we have all the equipment within our fleet, a trained and capable staff to complete a project from start to finish. A great alternative to reduce fuel costs and eliminate monthly fuel bills. Above ground or below ground fuel tanks that are safe for the environment and your home, warrantied and protected against leaks. Call us for a FREE estimate.